Matangi puja should be performed a place where you keep your money or safe. Purify the place with gangajal and make a rangoli with beautiful colors and flowers. Take bath in the evening and wear new clothes before commencing the prayer. "Om Hreem klim hum matangai phat swaha"
"Om Hrim klim hum matangai phat swaha"
Goddess Matangi or Rajamatangi is one of the mahavidyas. She is also considered as the tantric form of Saraswati and her worship is adviced to acquire supernatural powers, especially gaining control over enemies, attracting people to oneself, acquiring mastery over the arts and gaining supreme knowledge. She is also represented as the ministerial power of the Goddess. She is regarded as the counselor to Rajarajeshwari or Tripura Sundari, the Supreme Queen of the Universe. She is the one who gives us the ability to communicate with all the other Gods and Goddesses through the power of the mantra. In fact she rules over all forms of knowledge, counseling and teaching. 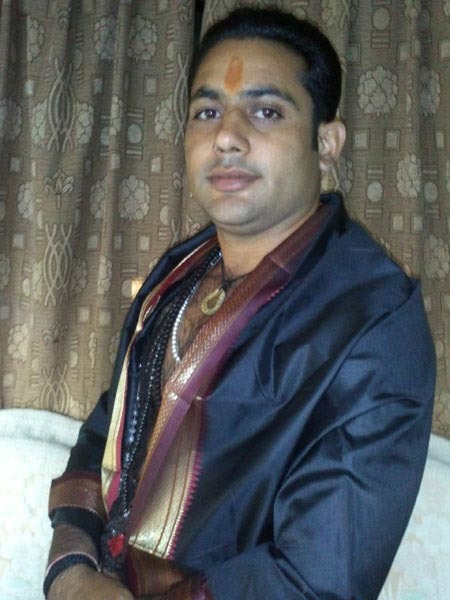 Hence devotees seeking proficiency in these areas should honour Rajamatangi. She is also worshipped as Ucchishta Chandalini or Ucchishta Matangini and in this form she is associated with pollution, inauspiciousness and the periphery of Hindu society. She is considered as an outcaste or chandalini and offered left over or partially eaten food called ucchishta with unwashed hands or food after eating, both of which are considered to be impure in hindu tradition. In this form, she is depicted as seated on a corpse and wearing red garments, red jewellery and a garland of gunja seeds. She carries a skull and a sword in her two hands and is offered leftovers. In her other popular form, she is worshipped as Rajamatangi who is also called Mantrini and has power over all mantras , particularly over their vocalisation and articulation. 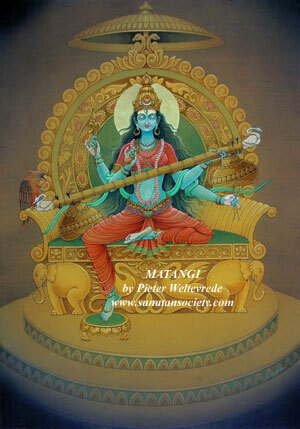 In this form she is depicted as playing a Veena showing her musical and vibratory power. She is beautiful and carries various weapons in her hands. Her colour is dark emerald green which is also the colour of the planet mercury that governs intelligence. She is often said to have a parrot in her hands which represents the powers of speech as inherent in nature. She sits on a throne made of gems.